This seems like a good time for me to make the case (again) for dried beans. Ironically, although about the least expensive food you can buy, I do realize that they are a bit of a luxury time-wise. I'm not talking about the overnight soak. I think many of us have an idea of what we'd like to make a day out, and soaking takes all of about .5 seconds actual work. But even after a good night soaking, the beans do have to be cooked for a bit of time to be ready. I don't judge if you want to use canned beans in your cooking. I'm merely suggesting that if you find yourself with a bit of extra time, canned has nothing on dried. Although this is by no means a labor intensive recipe, using dried beans is an apt metaphor for the entire process. Relatively light on work, but heavy on time. We are talking about stewing, after all. For me, that's okay most any day of the week since all I do is sit around and read a gazillion books. If it's not okay with you on a regular basis, save this recipe for a lazy Sunday afternoon when your only responsibilities include lounging, drinking coffee, and lounging some more. You'll be amply rewarded. This is an extremely healthy recipe, loaded with things that are nothing short of spectacular for your body. Primarily beans. And I'm willing to bet that just about everyone could use a few more beans in their lives. 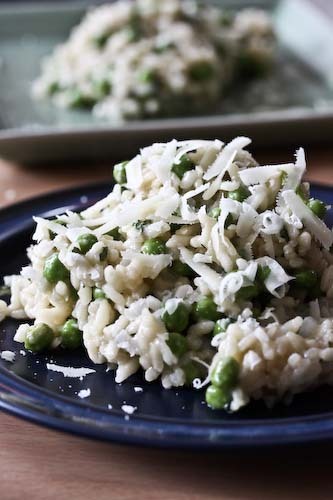 The recipe comes from Peter Berley's The Modern Vegetarian Kitchen, and has been only slightly adopted by me. The yield is 4 servings, but not if you take the easy way out and make it your main course for two people who pride themselves on healthy appetites. Then it serves 2, with unfulfilled requests for more. What can I say, we're gluttons. In this case, gluttons without guilt. Combine the drained beans and 4 cups of fresh water in a pot over medium heat. Bring the water to a boil, reduce the heat, and simmer, partly covered, for one hour. I added a bit more water part way through so the mixture wouldn't dry out. * I find an easy way to deal with the bouquet garni is to use an empty tea sachet meant for loose tea and just cram the fresh herbs inside. Fold the lip over and toss in the pot. UPDATE: Peter Berley e-mailed me! I'm such a loser, and get star struck so easily (but only by people I care about. For instance, I saw Cameron Diaz walking her dogs in Central Park a couple of months ago, and I really couldn't have cared less.). But anyway, he was so gracious and said that he's glad we're enjoying his cooking. Rock on! Healthy and tasty looking...gimme some bread with this and I'm in! Sounds like not your average stew. Healthy and delicious. I like that! I don't know if you've tried this, regarding dried beans, but typically what I do is put them in a crock pot and start them the night before (except kidney beans), or if I'd forgotten, I put them in the crock pot in the morning before I leave for class, covered in pre-boiled water. They're generally done perfectly when I get home. Alternately, a pressure cooker is a miracle worker. This sounds so hearty and delicious. 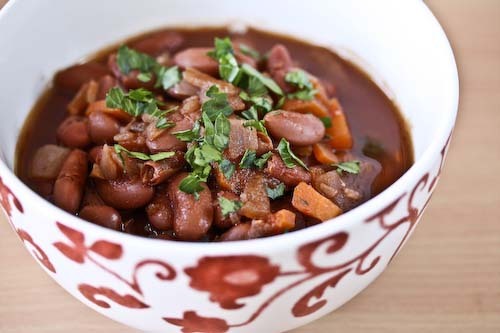 I love beans, and I love how you slow cooked them in a dutch oven. I definately have some extra time now that I'm on Spring break. Thanks for sharing Andrea! This is such an interesting recipe, it sounds really tasty. love it! i am a lover of beans & really don't mind the trouble of soaking & cooking. love ur bowl too. I tried the recipe and thought it was great! Thanks for sharing.